Are you feeling ready to roar? The opportunity to go deep, release and, yes, shake your mane and roar is on its way. We will experience a total lunar eclipse on Monday January 21, 2019. (Here’s how and where you can watch). Not just an eclipse (which is pretty special on its own), this is a super blood moon in Leo. A Super Moon occurs when the full moon is at the closest distance that it reaches to Earth in its elliptic orbit, often making the moon look larger than usual. A Blood Moon refers to the reddish glow that the Moon takes on during a Lunar eclipse. 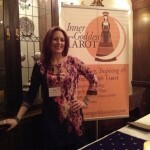 And, what does all this have to do with Tarot, and how can you make the most of this powerful celestial event? 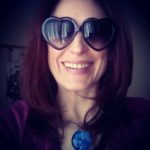 In my experience, Lunar eclipses are deeply connected with our own inner world, with our intuition. They speak to our truest selves, the self who may prefer to hide safely away from the outer world most of the time. This eclipse in Leo invites to you go within, have a chat with that inner you, but also to then shine your true, bold light out into the world. Lunar Eclipses also offer us the opportunity for release. 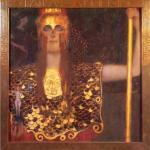 They reveal what is hidden in our lives, what wants to be seen, acknowledged, and understood. They give us the chance to let go of what is no longer serving us well, so that we can take the first steps forward on a new, authentic and more enriching path. They can help us to see the clutter (both figurative and literal) that needs to be swept away so that we’re no longer weighed down. When an event this phenomenal occurs, take note. Acknowledge that this is something special, outside of the daily grind, and give yourself permission to pause, to put aside some time to experience it and see where it takes you. Tarot is a beautiful tool to help us translate the messages that the Moon sends to us on occasions such as this. The cards are a gateway into another world, the realm of intuition and shadow, and act as our guide in this extraordinary place. Cleanse and charge your cards in the light of the Moon. Place them in a window, place a clear quartz crystals and/or a moonstones with your cards to amplify the energy. Meditation with the Moon card as your guide. Pull the Moon card from your deck. Place it on your altar if you have one, or just hold it out at easy arm’s length in front of you. Sit comfortably, breathe and center yourself, allow yourself to gently gaze at the card. Notice the details, be mindful of what your eyes are drawn to. Allow yourself to enter the landscape of the card, experience the environment around you, respectfully ask for the message that the Moon has for you to be revealed. Be sure to jot down anything that you want to remember and revisit. Meditation with the Eight of Cups as your guide. Please see the image above.This is another card (the RWS version) that to me seems to illustrate an eclipse in progress, certainly we see a full, impassive Moon looking down at the intrepid figure in red on the card. That figure is leaving behind something they love, or perhaps really going very far outside their comfort zone, to go on a spiritual quest. 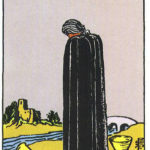 Using the technique described above, let yourself go into that card, be that cloaked figure. Ask yourself, do I know where I want to go next in my life? What do I have to leave behind or sacrifice to do that? What will help me on my journey? What might hinder me? Ask the Moon, who sees all, who isn’t bound by our human limitations, to provide you with guidance for your journey. 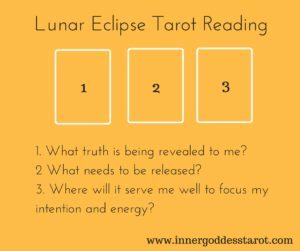 My Lunar Eclipse Tarot Spread: At the time of Eclipse, ask your cards to help you to hear and understand the powerful message that the Moon wishes to share with you. Ask your most beloved Moon Goddess to reveal what will be most beneficial for you to know right now. 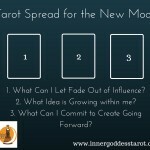 Here is a three card spread that I love to give you some structure for your question and the answer you receive: 1: What truth is being revealed to me? 2: What needs to be released? 3: Where will it serve me well to focus my intention and energy? 5. Don’t forget to LOOK UP! And if you can’t actually see the Moon, close your eyes, open your mind and heart, and let the energy wash over you. I invite you to focus your energy on the Moon between now and until the time of the Eclipse. Be open to messages, signs and dreams. 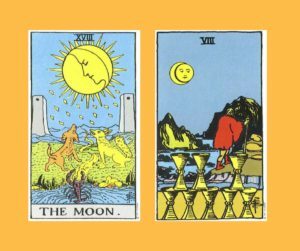 Does the Moon card itself appear in your Tarot daily draws? Or cards that include the image of the Moon? Do you find yourself or those around you using expressions or metaphors that reference the moon? Think about what the Moon means to you. 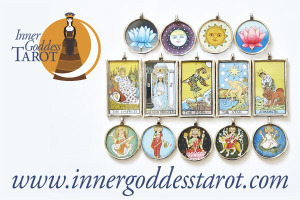 Identify a particular Moon Goddess who resonates with you and learn all you can about her. Surrender yourself to full moon fever, give yourself permission to ROAR.